Tuesday was a day of high drama for the South African markets, with local lender Capitec’s shares at one point falling 20% on the back of a report by Viceroy Research claiming that the bank was concealing losses and operating as a loan shark. Amid protests from Capitec and the South African Reserve Bank that the report was factually inaccurate, an increasingly pertinent question was the degree to which Viceroy stood to benefit by short-selling before tanking the stock . But others suggested that whether Viceroy’s report was hyperbolic or not, it still pointed to an ongoing ethical quagmire at the heart of South Africa’s microfinance industry. By REBECCA DAVIS. In one corner: a shadowy outfit called Viceroy Research, presenting itself as a crusader for transparency in business – but also acknowledging that it stood to benefit financially if the company it blasted in its latest report lost share value as a result. In another corner: the management of Capitec and the analysts of the South African Reserve Bank, with both groups categorically refuting the claims of Viceroy that Capitec should be placed under curatorship before it inevitably collapses under the weight of dodgy loans. In yet another corner: independent financial analysts and economists, watching with evident concern and frustration as Viceroy’s claims about Capitec were aired all over the media and made themselves felt in rumbles through South African markets. And in the final corner: the South African public, torn between suspicion of big business in the wake of the Steinhoff scandal and suspicion of US-based fund managers getting rich off turmoil on the Johannesburg Stock Exchange. What a mess a single day can bring. “It is too early to draw any conclusions,” the former FNB CEO Michael Jordaan cautioned Daily Maverick, urging that the emphasis be placed by all parties on verifiable facts. Given the seriousness of the allegations, however, Jordaan suggested that an independent third party should investigate the points made in Viceroy’s report. At least two South African opposition parties took the same approach, with both the Democratic Alliance and the Freedom Front Plus calling for an inquiry into Capitec. Intellidex CEO Stuart Theobald pointed out to Daily Maverick that some parts of the Viceroy report could already be classed as inaccurate. Viceroy claimed, for instance, that there was “no operational difference” between Capitec and its doomed forebear, African Bank Investments. This is false, says Theobald. Capitec “does not rip clients off with insurance premiums”, has a “much better funding profile” and “diverse revenues”. Capitec, Theobald adds, “has never overpaid for, and then tried to run, a massive furniture retailer” – a reference to African Bank’s acquisition of Ellerines. 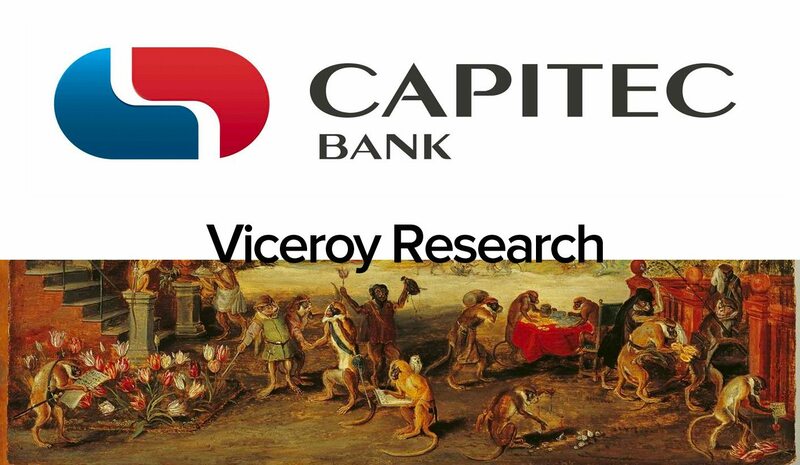 Pan-African Investment CEO Iraj Abedian said Viceroy’s research could not be trusted, and that it would be almost impossible for a small outfit like Viceroy to carry out a sufficiently thorough investigation into as complex a bank operation as Capitec. Abedian said that the South African media and public should not bestow credibility on Viceroy until more information was forthcoming about who they are and how they operate. But to others, while the specifics of Viceroy’s claims may demand further scrutiny, the gist of the report came as no surprise. In this camp is South African businesswoman Wendy Appelbaum, who has been an outspoken critic of South African microlending practices for the last few years. Appelbaum stresses that she has no truck with Viceroy. “They’re not doing it for the love of the country, so one immediately has to be a bit circumspect about their motives,” Appelbaum told Daily Maverick. But Appelbaum has been challenging government for some time to take on operations like Capitec, which she charges with exploiting the poor. She has been vocal in condemnation of the National Credit Regulator (NCR), which has received numerous complaints about Capitec’s lending model and either declined to take action or effectively certified Capitec as being compliant with lending law. On Tuesday, the NCR’s website featured a message informing the public that its phone lines were down. The NCR is the national body specifically tasked with ensuring that South African lenders are in compliance with the National Credit Act. As recently as January, the NCR released a statement warning consumers of the dangers of over-indebtedness, and reminding the public that credit providers “are required to conduct an affordability assessment to assess the consumer’s general understanding and appreciation of the risks and costs of the proposed credit”. It is one of Viceroy’s claims that Capitec “did not properly conduct affordability tests”. The NCR is the subject of an ongoing Public Protector complaint laid by Summit Financial Partners and supported by Appelbaum. Summit is also taking court action against Capitec and the NCR. In the Viceroy report, it uses the court papers filed by Summit since 2016 to support its claims against Capitec. Summit CEO Clark Gardner told Daily Maverick that “three short-selling hedge funds in the UK and the US” had contacted Summit in the last few months to ask about its ongoing court action against Capitec. Gardner now assumes that these funds were acting in concert with Viceroy. Gardner says that the Viceroy report is factually true in parts. Summit first became aware of Capitec’s lending practices with regards to employees at Anglo American, where Gardner says Capitec was providing multiloans during a time of strike. As a result of the NCR’s failure to take action against Capitec, Summit has court cases lined up throughout this year, beginning in March. Gardner says the Capitec issue is a microcosm of what is happening throughout the South African microfinance industry. On Wednesday, Gardner will appear before Parliament to make the case that the NCR is not policing this industry adequately.